The students of Notre Dame Junior/Senior High School must complete 40 hours of community service before they graduate from our academic program. We strive for all of our students to become active participants in our local community so they realize the value that their service has on the people around them. 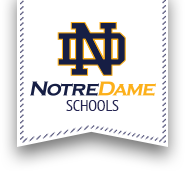 Education at Notre Dame Schools is more than just the classroom. We mold our students to become individuals who are ready to make a positive impact on the world.